Islamabad (Staff Report): The Supreme Court (SC) on Wednesday issued a written verdict on a suo motu case pertaining to Tehreek-e-Labbaik Pakistan (TLP) sit-in at Faizabad Interchange in 2017. On November 2018, the top court reserved its verdict on the case. A two-member bench comprising Justice Qazi Faez Isa and Justice Mushir Alam reserved the verdict after hearing arguments in the case. During the hearing, Justice Qazi Faez Isa observed that every force in the country is subservient to the Constitution and stressed that whoever defies it is a ‘traitor’ in view of Article 5 and 6. The Article 5 reads that loyalty to the state is the basic duty of every citizen and obedience to the Constitution and law is the [inviolable] obligation of every citizen wherever he may be and of every other person for the time being within Pakistan. While Article 6 states that “any person who abrogates or subverts or suspends or holds in abeyance, or attempts or conspires to abrogate or subvert or suspend or hold in abeyance, the Constitution by use of force or show of force or by any other unconstitutional means shall be guilty of high treason. Earlier the day, Justice Qazi Faez Isa issued a contempt of court notice, saying the attorney general of Pakistan (AGP) has failed to appear once again. The AGP, however, did appear but was late. “We are issuing a contempt of court notice,” Justice Isa said. During the last hearing on November 16, the AGP had also failed to appear before the court at which Justice Isa had expressed anger and questioned the government's seriousness in pursuing the case. 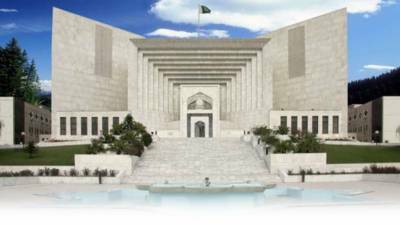 In November 2017, the top court had taken suo motu notice of the three-week long sit-in, which was held against a change in the finality-of-Prophethood oath, termed by the government as a clerical error, when the government passed the Elections Act 2017. Secretary Election Commission of Pakistan and attorney general of Pakistan (AGP) responded to questions by Justice Isa about whether these authorities can issue a notice to and suspend membership of a party.